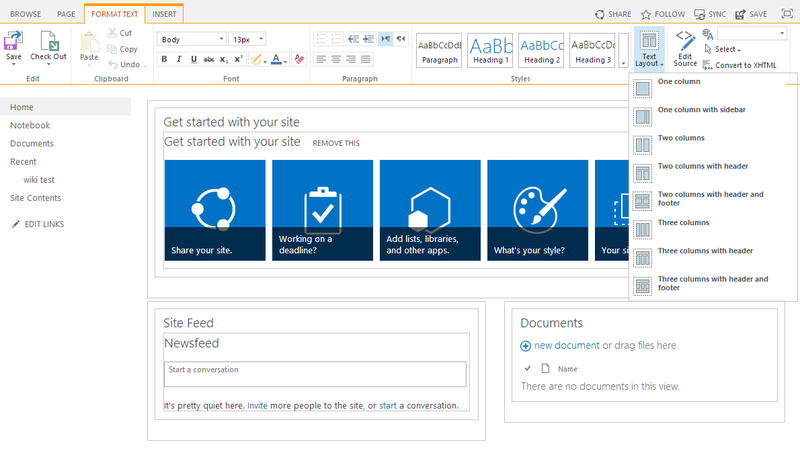 SharePoint 2010 and 2013 have two main page types: page layouts and text layouts. In this article, I will look at the text layout functionality. Note that when you choose a different layout, the content never gets lost! One of the nicest things about using the text layouts is that they’re easy to use and they meet 95% of all requests. They arrange themselves depending on the used content, which is great. I personally have never seen a reason to actually change these. 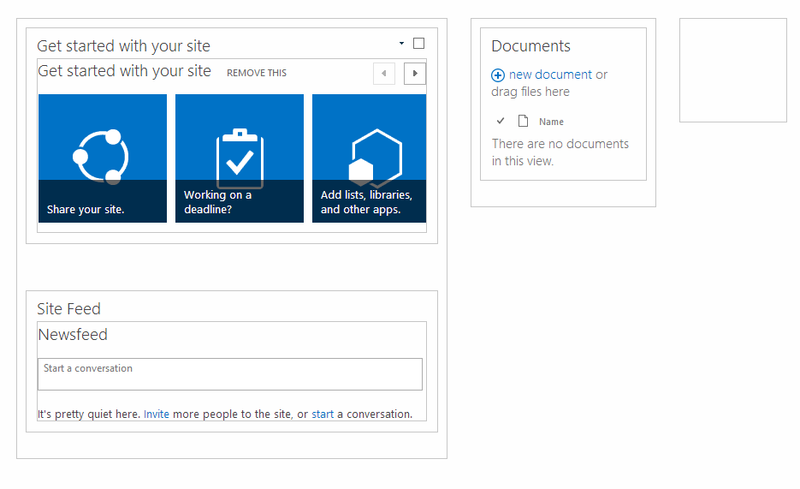 However, you can change this on a page-by-page basis by editing the page in SharePoint Designer – I wouldn’t advise it, because it will create a maintenance and standardisation issue. Have you come across a situation where the “Text Layout” option is not visible for a page? I have some pages where it is visible and others where it is not and they “appear” to be the same page type. Any ideas? Let say you did want to permanently modify one of the standard text layouts or add a new one, do you know where and how would you make the changes? There are quite a few good, basic layouts there that should cover most of your needs. My first thought is to ask why these don’t meet your needs and if you could find a way to make them work for you. As far as I know, it’s possible to change these text layouts programmatically. I heard somewhere that there are files you can edit on the server, but then you’re editing default files which is generally a bad idea. Long story short: generally considered not to be worth the effort. Unfortunately, as a SharePoint Admin, my needs are generally considered irrelevant. If a team leader has enough clout, they usually get what they want so my request stems from a request for a text layout that has a small left hand margin say 25% and the right hand margin taking up the rest of the page. So in essence, it is the one-column-with-sidebar but with the margins reversed. I know I can change one site page using the SP Developer but I want the layout to be generally available because they will want to generate more pages like this. I understand your point about customizations and my first preference would be OOB functionality however, in it’s absence I have to consider carefully documented customization where necessary. In a Text Layout that has a box across the top, the box is much wider than I want. I want just one line of text, like a heading. But the box is over an inch vertically — is there a way of making it shorter? There is no way to do this without going in and changing the code. How can I assign a custom .css or a custom ,js file to a wiki page in sharepoint 2013, or a text layout for a wiki page? I’m looking for either solution that I can apply as a UI developer. I’ve been looking for a way to add new text layouts without requiring a change to the master page or default files and I don’t think there is a way to do it. However, if you want to change a text layout so that column widths differ from the defaults, you can do this in SharePoint Designer. For example, I had a customer who wanted a three column layout but wanted the center column to be wider than the left and right columns. I simply chose the three columns with header and footer layout, edited the page code in SPD so that the left and right column were each 25% and the center column was 50%. This of course unghosted the page when we saved it, BUT you can reset the page back to the site definition and it maintains the changes to the column widths. We then made a template of the site so that it would be available for future use. I’m sure you could probably do the same thing with a page and save a copy of it in the site pages library as a template as well. You can even add a completely new zone using SPD (i.e. creating a fourth column), but unfortunately the new zone cannot be edited in the browser. When you set the page to edit mode, the new zone will not appear. I don’t believe there’s an easy way to resolve that. You can add new data views using SPD, but that’s not going to be very efficient for your users. Is there no way to add the teamsite functionality to a publishing site? IF the site was first created as a publishing site, there is no way to add the “Text Layout” type page? Sure you can! You need to enable the Community Site Features which will create a number of lists and libraries on the site, including the Site Pages library. You will then have both the Pages and the Site Pages library. I believe using the cog and Add a page option will create a normal publishing page, so you will need to create Site Pages by going to that library and creating them from there. Thank you for your reply. So from Site Pages I would create a wiki page? Is there anyway you know of to change the default for create new page? So when my users go to the cog and create a new page they get this page style? Any Site Page is automatically a page with basic wiki functionality, as described in the post. I don’t know of a way to change the behavior of the add a page option,but I would suggest looking at my article regarding adding publishing to a team site to get an idea of the standard behavior. Just wanted to know if there is any way in which we can add custom Text Layouts in ribbon?. Hi! There might be a way of doing this, but it would require custom code. The whole purpose of these simple text layouts is that they should meet most needs. Good luck! I need to add another column to the text layout, not with the options I have but an additional one at the bottom. Is this possible? Hi Naty – as stated in the article, it’s possible but not a good idea as it negates the whole thought of fitting within the easy templates. Publishing page layouts might be a better solution, depending on your needs. As far as I know, there is no out of the box way to set the default text layout.